"The Divine Mother is always there with open arms. All she wants us to do is love our selves, because when love is present we are connected to the Divine energy. The love of self that I speak of is not a selfish or egoistic love. I am talking about LOVE: a spiritual energy; a force that goes beyond the boundaries of relativity and materialism. Another way to connect to our hearts is being in the silence. Being in the silence is about practicing silent meditation even when in the midst of the intense activity of everyday life. It is the Mystical Feminine principle of “relaxing and releasing” tension, in contrast to the masculine principle of “striving to attain.” The silence brings us to the conscious awareness of who we truly are – unique individual aspects of Divinity itself. It is the evolutionary expansion of our identity introducing us to the Inner State of Grace, which is the home and source of all Love, Peace, Joy and Wisdom". "Tara means "star," "planet," or "she who ferries across." She is a bodhisattva embodying compassion in the female form of a young goddess. 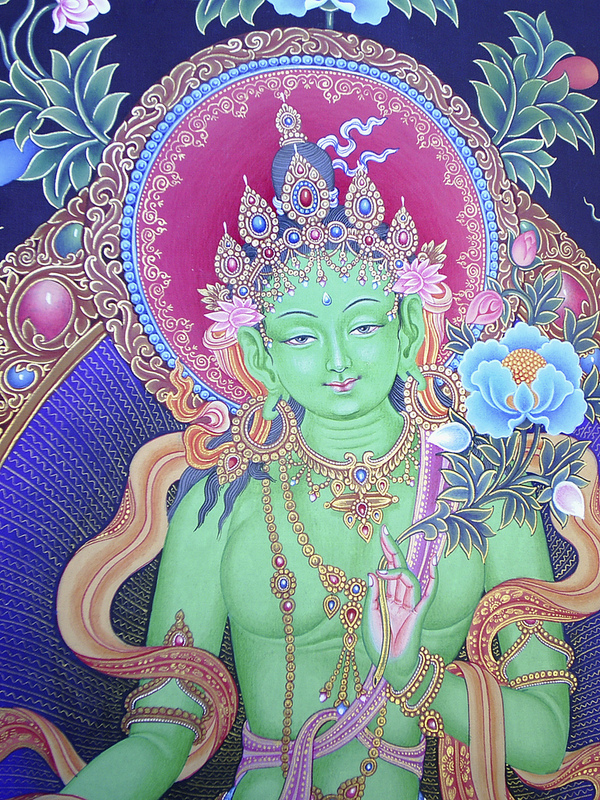 She is often considered to be such an advanced bodhisattva that she is actually a Buddha. Tara’s name is said to derive from the verb meaning "to cross" or "to traverse". In Pali the verb taratimeans "to get to the other side." This word is cognate with the Latin "trans" (across). The word Tara also literally means "star." An interesting overlap between these two senses is the use of stars in navigation. The Pole Star, used at least for millennia to guide travelers, was known as Dhruva-Tara (the immovable star). Tara becomes a focal point on the far shore that helps us guide our lives in a safe direction. We can take her enlightened qualities of wisdom and compassion as our guide, moment by moment, as we navigate our lives. A third meaning of "tara" is "the pupil of the eye," again suggesting a focal point and conveying a sense that Tara watches over those who navigate the treacherous waters of life in search of the further shore of liberation." 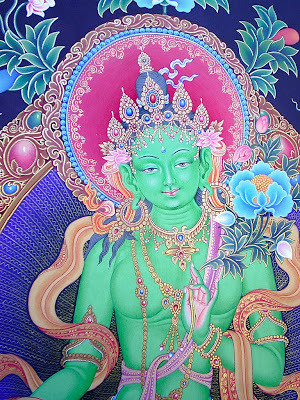 "Traditionally, even in Buddhism, which has seen countless enlightened women, the female form has most often been seen as disadvantageous for the pursuit of the spiritual life compared to the male form, to the extent that female spiritual aspirants often aspire to be reborn in male form to help them in their future spiritual endeavors.